I like to cook. You may have gathered that. I have a hippie foodie friend (love ya, Tasha!) who kept telling me about something called Community Supported Agriculture, or CSA. She sent me the website localharvest.org a while ago and encouraged me to look into it, for reasons of fun and health and the environment. Essentially, the idea of a CSA is a farm selling “shares” of produce to consumers who either get stuff delivered or pick it up at a convenient spot. You get a selection of whatever’s in season, usually in a basket or cooler. Some farms are more fruit-heavy or veggie-heavy, some farms offer extras like bread and cheese and eggs. Either way you’re getting very fresh, locally-grown food, and you’re helping encourage and support local farming. The only negative side is that you get whatever they’re sending you, and you don’t get a choice about what’s in your basket (although most places advertise that they’re accommodating for allergies), so you may end up with a huge pile of kale you don’t know what to do with. This year, settled into the new house and feeling somewhat housewifey, I thought the fall might be a good time to try this out, because we could do a shorter session (8 weeks), and see how we liked it. I split a share with my mother-in-law because it seemed like too much food for just the two of us, and she was also available to pick up our shares on Thursday afternoons. We weren’t all that impressed, which is unfortunate because I think this is a great idea. The experiment did get us to try new types of vegetables (mostly squash), some of which we liked. It was a good way to learn new recipes and broaden our horizons. But sadly the quality was inconsistent. Many times the apples looked like they’d been used as tennis balls, and some of the tomatoes and squashes molded or rotted after two days. This was an organic farm, so I expected our produce to look less than perfect, but pesticides aren’t what prevent bruising and rotting, so I”m not sure what was going on. 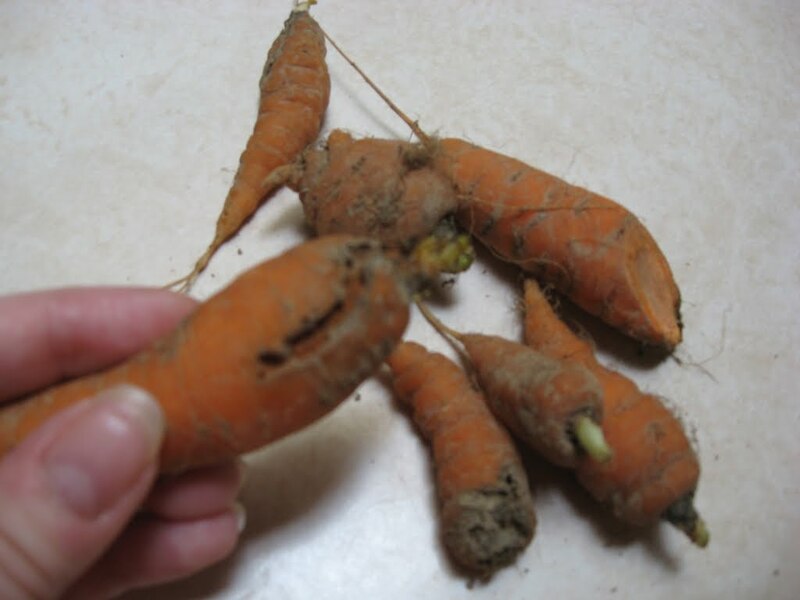 Do these look like healthy carrots to you? The strange part was that their farm stand at the farmer’s market seemed to have much nicer stuff than what we were getting. We should have complained earlier, I guess, but we kept thinking it would get better. The bug-coated kale and rotten-on-the-inside nectarines were the last straw, though, and we had to say something. The underside of the kale leaves seemed sandy to me and so I tried to wash them off, only to discover that the “sand” was a layer of aphids. And not washing off easily, either. I was going to make kale and potato soup out of it but I got nauseated thinking about little green aphids swimming in the bowl. The guy at the stand the next week was kind enough to offer us a “refund” by letting us take stuff that would cancel out the value of the kale and nectarines, but still. We won’t use that farm again. Especially when they got all snotty with us when I posted a less-than-stellar review of their CSA on that website. I want to try again with a different place next year but I’m nervous. We’ll see. Spring shares mean salad greens and berries, so maybe it’ll be worth it. This entry was posted in Uncategorized on November 6, 2010 by antijen. Very sorry you had a bat first experience but I think it’s definitely worth a second try in the spring. Like you said, berries and salads might be better and from a different farm. No matter what, I will say that snotty responses and bug-covered produce are unacceptable. It’s tough running a farm, I do get that, but there’s still the customer service aspect to the CSA sales. In our CSA the produce often comes somewhat dirty, because it’s better to wash right before use or something, but not buggy. I’ll accept finding a bug here or there; that’s just going to happen. Like you, though, I’d be furious about aphid covered anything. A CSA is a great thing to get wonderful food (usually) and to know that a bad year won’t wipe out a local farm. But THAT is supposed to be the gamble; how much food you get (and, yes, to a certain degree, how good), which always relates to the weather. It’s not supposed to be a gamble on how your farm interactions go.